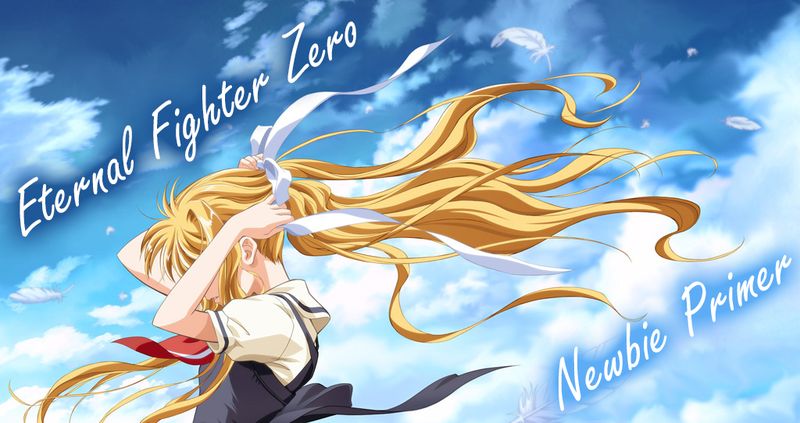 Eternal Fighter Zero (EFZ) is a fan made fighting game by Tasogare Frontier based on some of Key’s older visual novels: Air, Kanon, Moon. and ONE. 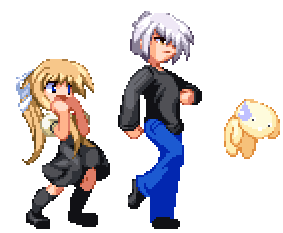 Released in 2001 for Windows PC at Comiket 61, with it’s last version being released towards the end of 2005, the game has been shown love from it’s creators and fans alike. Together they helped iron out bugs and balance the game where needed. The final product is an incredibly solid fighting game with a huge amount of freedom -each character has enough tools that two players may play totally differently. From the combos, to pressure, to zoning, everything is free form. With charming animations and lots of attention to detail, these are just a few of many reasons why people love this game and why it’s still being played to this day. The system mechanics are heavily inspired by Guilty Gear, each character has their own unique strength which is coupled with strong universal defensive mechanics – everyone is scary, but even the player on defense can be a threat. The combo system can be as simple or as complicated as you want – on then ground combos are limited by pushback, in the air by a juggle meter. Beyond those constraints, anything goes. With dash cancellable air normals and Blue Instant Charge increasing juggle meter, almost every character has a reliable corner-to-corner carry, and every character can do 60%+ damage with the right meter and positioning. These mechanics allow for a lot of freedom in creating your own combos and setups, and players can easily be recognized according to their personal style. The characters lend themselves to this too, their moves are extremely versatile, to the point where two players can focus on different subsets of specials and still play very effectively. Two mechanics in particular stand out in giving EFZ a unique flavor: Instant Charge and Recoil Guard. Through the use of the RF meter (basically your EX meter) you can do a sort of super roman cancel, called an Instant Charge (IC). It is done by inputting 22C after a move has hit with either Red or Blue RF meter, consuming it entirely. The most obvious thing an IC does is to cancel the rest of your move’s animation and return you to neutral, allowing you to follow up with anything. This makes Instant Charge useful for making moves safe, extending combos, and creating mixups. While a Red Instant Charge behaves similarly to Roman/Rapid Cancels in other games, Blue Instant Charge (BIC) also gives a large boost to damage and juggle, making a player with a fully charged meter a huge threat. And while saving up for a full Blue RF meter makes a player extremely dangerous, this comes at the cost of not using RF moves or Red ICs, which can be quite powerful. RF specials in particular can give a massive advantage in neutral, and are generally the only way to get specials with full invulnerability. RF Ricochet Shot gives Makoto full control over the match while it’s out. A player’s Blue RF meter also gets drained when the opponent hits him, adding a layer of risk to holding onto it, as the less Blue RF meter you have, the less damage and juggle bonus you get. An entire round spent saving up for a full BIC, all for naught. The other mechanic that makes this game so much fun is Recoil Guard (RG). This is done by switching to block right before a move connects, similarly to an Instant Block or Just Defend. If done correctly, you will negate blockstun, chip, pushback, and be able to act almost immediately. This creates huge opportunities to reverse the opponent’s momentum, barring one thing… counter RG. When you counter attack after a successful RG, your opponent can actually recoil guard that counter attack, no matter what move he’s in the middle of. It is actually possible to counter RG no matter what your character is doing, even if he is in hitstun – this is called a Recoil Counter. No matter what ridiculous pressure your character is under, RG always offers the potential to turn the tables. As a rule of thumb, counter attack after C normals and specials, and after some B normals. If you RG an A or 2A, just keep blocking, your counter attack would most likely lose to their A mashing. As for other universal defensive mechanics, the game doesn’t have many of them, outside of air teching. As mentioned previously, the main way you’ll be getting out of being on the defensive is using Recoil Guard to punish slow recovering attacks. One very important aspect to escaping that new players may not realise – air teching is awful and should rarely be used, unless you know you will be a safe distance away. If you air tech you will briefly be unable to do anything, leaving you vulnerable to attacks. All characters can add a tech trap at the end of their combos, which in the best case leads to an air throw, in the worst case to a 7000+ damage punish. The good news is that teching is tied to the juggle meter: when it runs out, you can tech, but cannot get hit. This means that failing to tech only gets you knocked down, it does not give the opponent more damage. Add this to the fact that there is no absolute guard, minimal crossup protection, and some brutal ways to mix up your opponent, it makes for an incredibly momentum based game. Which is why mastering Recoil Guard is important! If you’ve read this far, all you can do now is give it a try yourself. Acquiring the game is tricky, you’ll have to look for it yourself or ask the right people. What follows are descriptions for every character, have a browse and see who you would like to play! We hope to see you in EFZ! http://wiki.mizuumi.net/w/Eternal_Fighter_Zero – The only English wiki. Not all that reliable, but useful. Tier List – EFZ is very balanced overall, the gap between even the top and bottom tier isn’t very large. Comments: Akane is the Millia of EFZ, both in how sheplays and how she looks. While she has low damage, her mixup game is extremely strong as in addition to Millia’s tools, she received Urien’s Aegis Reflector and Akuma’s Demon Flip. 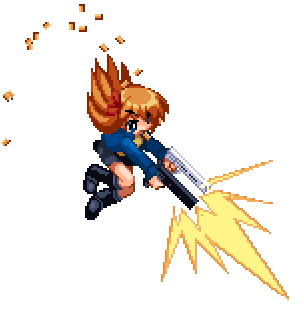 She is also a threat in the neutral game, being able to use Captain Commando style assists to control space. Her limits are mostly linked to the player’s execution, as the timings of her various setups and combos are extremely tight and character specific. Tips and Tricks: Always choose 1P side, as being 2P forces you into the corner after demon flip throw, which messes up a lot of her good stuff. Comments: Akiko excels when she is in the air – she has access to two air dashes, a forward ground dash that places her airborne and some of the best air normals in the game. Her jB is especially potent in combination with her hoverdash, as it is fast, stays active for a very long time, and hits up to 5 times. She can freely control the number of hits it does by choosing when to cancel it into her jC, if at all, which allows her to land cancel it into lows. 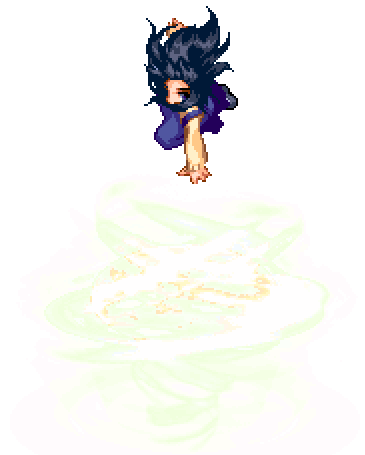 As if the variable number of high hits wasn’t hard enough to block, she can also cover up the opponent in smoke, which drains them of their RF meter, and makes it physically impossible to see what her mixup is. Add in the ability to corner cross up, time slow, and scary damage output, and you get a character who can take a match off a single touch in neutral. Her main weakness lies in her ground game, which is sorely lacking, and the precision and practice it takes to correctly convert off her hits. Comments: Ayu is a very mobile character with decent damage and good mixups. She has access to a hover dash, two air dashes, and the ability to influence her airborne momentum with the S key. On the ground, Ayu excels when up close to the opponent, but suffers from lack of ranged options. Ayu has a number of tools to keep herself next to the opponent, but she also has the tools to keep opponents at bay, including a traditional DP and the surprisingly good EX taiyaki. 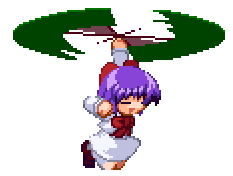 When she gets a knockdown, Ayu can exploit her momentum to create an extremely hard to see 5 way mixup, which leads back into itself after dealing a generous amount of damage. 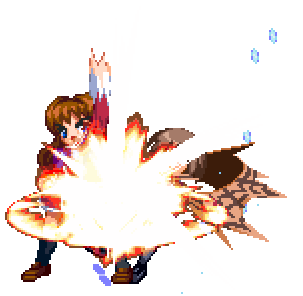 Ayu also boasts a very different hurtbox than other characters while being comboed, requiring the opponent to have trained Ayu-specific combos in advance. Ayu allegedly has the most reversals out of the entire cast. Comments: Doppel is a high damage grappler – the only one in the game. She is also the only character with techable throws. 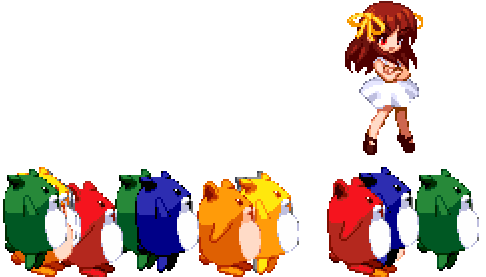 Her command throw has three stages; at each stage, she can choose either A or B, and if the opponent guesses the correct button, they will tech out of her throw taking no damage for that stage. On the other hand, if she lands all three stages, she deals massive damage. She may also choose to do no follow-up for a little bit of guaranteed damage. She is essentially Rumi without a sword with some buffed normals and access to different specials. Comments: Ikumi is a rushdown heavy character, equipped with a very fast dash, command throw, standing overhead, two air dashes, and high priority on many of her moves. 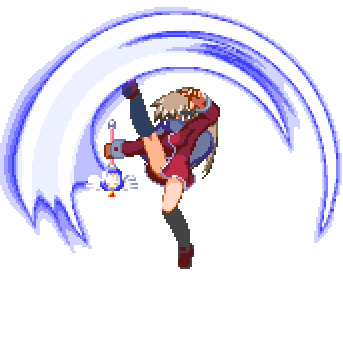 With meter, she gains access to clones, which pressure the opponent in various ways, allowing Ikumi to run her mixup game freely. 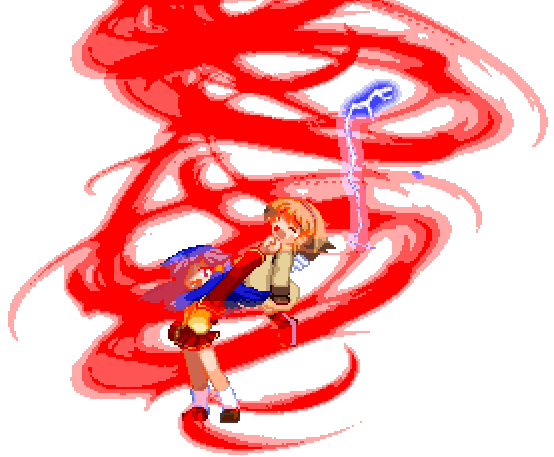 At far ranges, she has access to a blood tornado, allowing her to pressure and keep her opponents at bay; however, the recovery time is long, and using the wrong tornado can lead into an opening for your opponent. Her special feature is a blood meter. All B moves, as well as special moves, will draw blood from your opponent, splattering it on the floor. As Ikumi picks up blood, her specials grow more powerful, but also start to drain the blood meter. 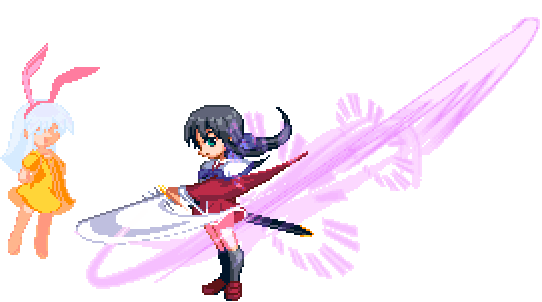 At full blood, Ikumi activates Genocide mode, giving her a timed amount of super armor and powering up all her special moves to max. Comments: Kano is a character focused on space control,she has access to the best projectiles in the game and incredible range on her normals. To balance this however, she is extremely slow and has a lot of trouble opening people up. Her defining mechanic is her magic: any spell she uses requires a fully charged magic meter. She can charge by pressing D, and cancel it by pressing D again, which, in combination with the range on her normals, allows her to do safe Order Sol style charge cancel pressure, varying the timing on her strings and giving her massive frame advantage. This however only works while her magic gauge is not full, so she continually needs to consider the trade off between access to spells and access to charge cancels. Comments: Kaori is the boxer-type fighter of EFZ, taking after Dudley from Street Fighter, even gaining his “ducking” move. As a boxer, Kaori is extremely strong in close quarters, and excels when the opponent is in the corner. She has basic combos that can carry the opponent to the corner, and with meter, has much more advanced combos that can deal massive damage. It is not unheard of to see a Kaori take back a match that she has been losing by 50, 60, even 70 percent life. Her weakness lies in being zoned out by characters with strong projectile games, and she must make masterful use of recoil guard and ducking to get in before she loses the match. Comments: Mai is a sword character with a ghost assist, a mix between Eddie and Johnny from Guilty Gear. She has very strong lockdown and control over the match once she gains momentum; Mai will utilise the ghost assists to zone, to cover gaps in blockstrings, and to create mixup opportunities. This ghost has a cool down below Mai’s health bar and needs time to regenerate. If the ghost is hit by the opponent, the regeneration takes longer. Most of Mai’s sword moves have a hurtbox and terrible recovery on whiff, so she is a lot weaker without the ghost covering her. Comments: Makoto is a tricky fighter, using many traps and bullets to both zone and pressure her opponents. While her normal combos are fairly weak, she gets most of her damage from her very strong mixup game. On knockdown, she can set a variety of very long lasting, high priority moves, such as a smoke bomb or a ricocheting bullet. This allows her to choose high/low or right/left mixups while ensuring she has the advantage, even on block. Good use of EX moves allow her to not only reset the fight to neutral, but often take the advantage. Her weaknesses include relatively low damage without the use of meter, a DP that will often miss opponents using low profile moves, and her godawful airdash. Comments: Mayu is a close range, highly mobile rushdown character with a hop instead of a dash. 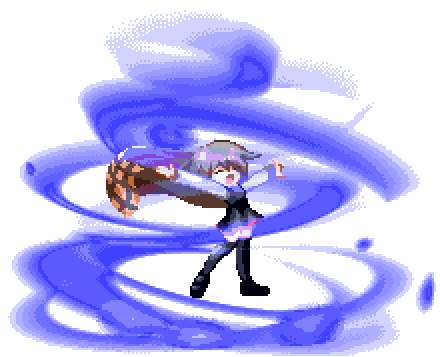 Once Mayu has the opponent cornered, she can run high/low mixups all day, while threatening with her assortment of command grabs. Mayu’s weakest when she is not in the opponent’s face, but she does have an incredible amount of ways to force herself in. Mayu has quite possibly the most frustrating hurtbox in the game. Her normals are also extremely frustrating, as they have upper/lower body invulnerability, and are very hard to beat or punish. Comments: Minagi is an assist character, utilizing her younger sister/evil spirit Michiru to help lock down her opponents. 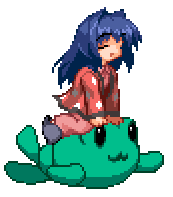 Minagi has very few special moves herself, as most of her special inputs direct Michiru to perform an action. She may also press the special button to move Michiru left or right (4S or 6S) or to change her stance (5S). Normally, Michiru will follow Minagi around the screen, but when in her other stance, she stands in place, ready to perform upgraded specials. 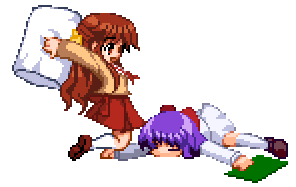 The combination of long lasting Michiru moves and Minagi’s normals allow the pair to safely mix up the opponent. 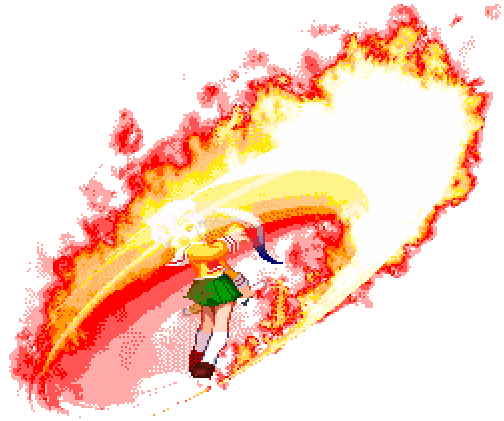 Minagi has many drawbacks, including losing her assist character for 3 seconds if Michiru is hit, weak A and B normals, and lacking reversals without meter. Comments: If you want to play a character who is strong at everything, at every range, then Mio is the character for you. She is two characters packed into one, and can switch between 2 stances, close range and long range mode. Both stances have their own normals, specials, supers and even movement options. In her close range stance, Mio is an excellent in-fighter, with great normals, fast movement, many mixup options and a large array of reversals. In her long range stance, she becomes arguably the strongest zoner in the game, with ridiculous dhalsim style normals that can chain into each other and space control specials that can even overwhelm the other zoning specialists. The stance switching itself is extremely strong too, being fast to the point where she can gain frame advantage by cancelling moves into it. Her only real weakness is her lack of strong reversal option once she gets cornered in long range mode, which can easily take her from a full life lead to a loss against characters with strong offense. While her lack of zoning moves in close range mode might be a weakness in theory, it only comes up in a handful of scenarios in practice. Comments: Misaki is one of the more straightforward characters in the game, with some strong but very linear frame traps, which lead into very high damage combos. Inspired by Geese Howard, she possesses Reppukens, counters, and multiple moves with autoguard to bully her way in. 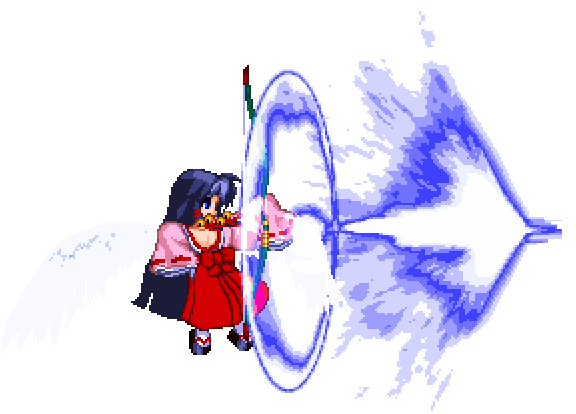 While her mixup game is fairly weak by EFZ standards, any stray hit can lead to massive damage into reversal safe oki using her Down Burst super. To complement her frame traps, she possesses high damage command throw supers, which vacuum opponents attempting to escape them. Comments: Mishio has the slowest walk/dash in the game, but makes up for it with how strong she is in every other aspect. She has the best mid range normals in the game and is one of the few characters with a fully invincible, meterless dragon punch. 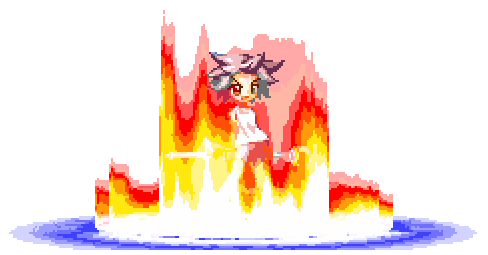 Her defining characteristic is her element system: while she starts out fairly weak with only one special, the dragon punch, landing it randomly assigns her one of two elements: fire or lighting. Each element gives her access to new specials, with lightning specials focusing on space control, while fire specials grant her massive damage potential. Some of the elemental moves consume the element and put her back in her weak elementless state, forcing her to connect with 623* again. You can however IC the skills to keep the element. 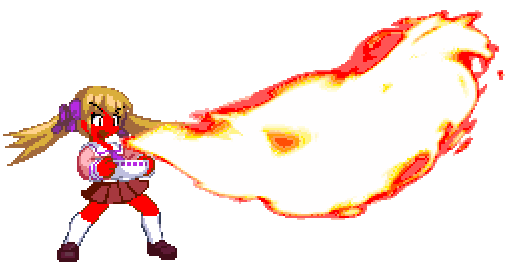 Comments: Misuzu is the EFZ version of Guilty Gear’s Testament, with her moveset taking strong inspiration from his. 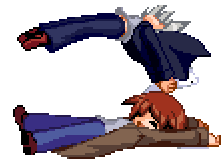 As with Testament, a major aspect of her neutral game is to control the opponent’s approaches through the laying of traps, which activate on contact. 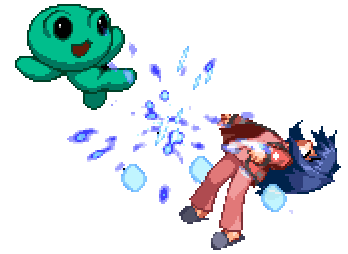 Unlike him, she also has the ability to set a curse on screen, a projectile which slowly moves in a given direction, pressuring the opponent to move in on her. The opponent thus finds himself caught between getting pushed in by the curse, and a wall of traps in front of him. These moves combine very well with her high priority normals, and should the opponent hesitate and chose to retreat, she has the ability to charge up a feather counter, giving her access to crow supers which significantly strengthen all aspects of her game. Once she lands a clean knockdown, her traps, hoverdash and juice lockdown give her elaborate oki options and curse combos, which add significant unscaled poison damage. Comments: With her strong normals, good reversals, great damage and overwhelming lockdown, Mizuka is widely considered to be the single best character in the game, outside of the last boss Kanna. Her unique ability to set notes, and have them explode when hit with her cello bow not only gives her great space control, but also allows for some extremely strong setups, which are only made stronger by her fast and hard to see overhead. Her trademark corner fortissimo lockdown gives her safe, airtight corner pressure which builds a huge amount of meter and can reset into itself on hit. She is also a character that scales very well with the player, as a beginner can win purely by using her strong normals and fast walk speed, while an expert player has room to grow in learning her more advanced note setups and clean hit combos. If she can be considered to have any weakness, it would be her lack of good long range options, and the difficulty she has converting off mid range hits in the neutral game. Comments: Nayuki is a straightforward, rushdown-oriented character whose main features are her very fast dash and high damaging combos. She has a few decent moves to play footsies with, but her main goal will be to take advantage of her dash to find openings and catch the opponent off-guard. She doesn’t have much in the way of extended pressure, and relies mostly on staggers and far-reaching lows to force respect from the opponent. However on a good knockdown she has time to set up her snowbunny super, similar to Rose orbs from Street Fighter, which allows her to stay on top of the opponent for much longer. For breaking defense she has a decent standing overhead and throw, both leading to a potential left/right mixup afterwards. As her gameplan and combos are both easy, Nayuki is a character well suited for players new to the game. Comments: Neyuki is an oddball character, who uses her sleepy kung fu style of tricky attacks and eccentric movement to fight in an unpredictable manner. Her character specific jam mechanic plays into this, making the options available to her at any given point harder to pin down. 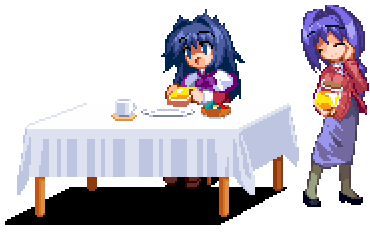 During the match, she can consume jam, and level up her jam counter up to a maximum of nine. Conversely, each time she gets knocked down, she loses one jam. As the jam counter increases, her moves gain upgrades, brand new moves are unlocked, and she even gains additional air dashes. 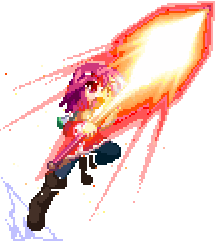 If a Neyuki manages to reach level nine, she becomes nigh unstoppable with very strong lockdown and mixups, triple air dashes with hitboxes, multiple escape options and high damage. On the other hand, if she drops all the way down to zero jam she turns into a miserable existence, stripped of many of her crucial moves and left with sluggish attacks, poor movement and pitiful escape options. However even at zero jam you can’t count her out yet, as her Final Memory is one of the best in the game due to its sheer damage output. and does good damage, but if it is not IC’d she throws her shinai away in a follow up leaving her bare handed. While barehanded she loses armor, damage, range and most of her specials, but is a lot faster and gains access to a new super. As a grappler, her gameplay style when on the offense is very much rock paper scissors, with some very good damage when she guesses right. Comments: Despite having an unusual hover dash, Sayuri is the closest thing EFZ has to a Street Fighter style footsies character. Her normals are some of the best in the game, while her mixups are fairly weak and straightforward, leading to a much slower paced fighting style based on poking and whiff punishing. Which is not to say that she completely lacks mixups, especially in the corner. 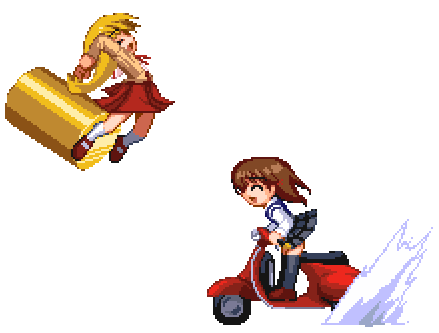 Her hoverdash, although slow, can be used to crush lows and land an overhead, while with 2 super bars she gains a 1F super command throw. In terms of specials, she gets some slow moving projectiles to cover her approach, while her Magical☆Press gets her a corner knockdown from anywhere on screen. Defensively, she has a number of reversals, and one of her more unique specials, the counter move Ah, Got Your Skill. This move can counter any melee hit, regardless of whether it’s a high or low. Once a move has been caught, every time she blocks it she will flash white. Pressing a button during that flash will trigger a genocide cutter guard cancel/alpha counter. Comments: Shiori might look like a zoner at first glance, but she is actually a very versatile character who can fit many different roles. Her ice cream beam and ice block specials allow her to pester the opponent from far away, and can make it very hard for anyone to get close. Her rushdown-oriented air normals and dash attacks also give her plenty of ways to get her own pressure started. In the corner she can open people up with endless frame traps and one of the best throws in the game, both leading to high damage combos. These aspects can further be enhanced by summoning a snowman, which helps her out by providing cover in neutral and allows for extended blockstrings after a knockdown. Add in fairly safe reversal options and you have a character who can deal with almost any situation. Comments: Unknown is a strong zoning and oki based character, who has by far the best movement in the game. In addition to having three different teleports and an arsenal of long range moves, she also gets access to her flight special ability by pressing S, which gives her absolute 8 way control over her movement, at the cost of draining IC meter. Her flight is an incredibly versatile skill: it can be used for movement, to cancel off any normal keeping her safe or maintaining pressure, and gives her full control on oki to create an extremely hard to see five way mixup. 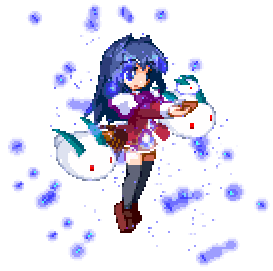 Her ability to oki and control the screen is further enhanced by her Great Migration super, which summons a lemmings parade off either side of the screen, keeping her opponent locked down and giving her the opportunity to mix them up. Comments: Kanna is the boss of EFZ’s Arcade mode and is banned from competitive play. She was patched in towards the end of EFZ’s updates and was never balanced, therefore she’s a head above everyone else in terms of power. She is by far the strongest character in EFZ, with ridiculous normals, instant overheads, unpunishable escapes, and is able to convert most hits into kill combos with very little meter.